Planetizen, a website about urban planning, reports on the Accessibility Explorer, a free online tool that allows the user to determine how many jobs in various categories, schools, parks, stores and libraries can be reached by residents of specified neighborhoods within a given amount of travel time. The tool was designed by Nebiyou Tilahun, assistant professor of urban planning and policy in the Urban Transportation Center, College of Urban Planning and Public Affairs. The Metropolitan Chicago Accessibility Explorer is an easy-to-use mapping system that measures the number of activities, including various types of jobs, schools, parks, stores and libraries, that can be reached by residents of specified neighborhoods within a given amount of travel time, by a particular mode and time of day in the Chicago Metropolitan area. The results are displayed on maps that can be adjusted by scale and area. 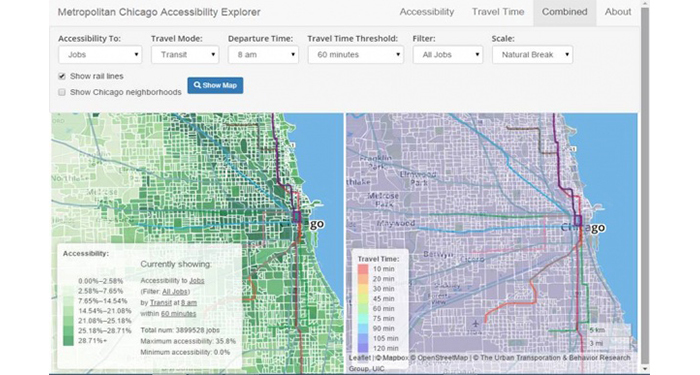 The Accessibility Explorer was developed by the Urban Transportation Center, which is a unit of the College of Urban Planning and Public Affairs at the University of Illinois at Chicago help policy makers, planners, and the general public easily evaluate how transportation system and land use change could alter accessibility.